This is a wood hexagon glass countertop display cabinet. This case features a locking door to help in the prevention of theft. The two shelves in this countertop display cabinet are tempered for added durability. They are also adjustable to make them easy to customize. The countertop design allows this display case to be placed at a convenient point for the customer. For additional lighting one 50 watt light comes standard with this case. This ensures that lighting is consistent and constant. We also build wood hexagon glass display cabinet if this design does not fit your requirements exactly. 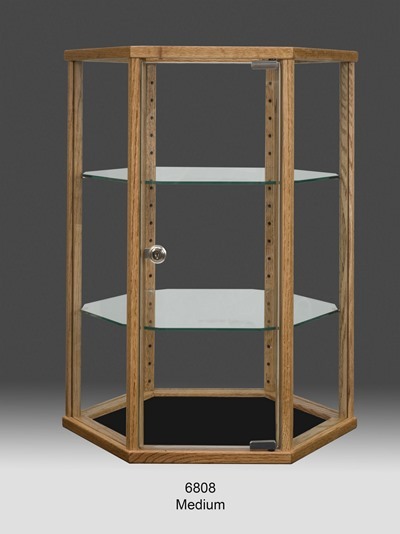 Click here to view the full line of custom finishes we have available for this wood glass countertop display cabinet.